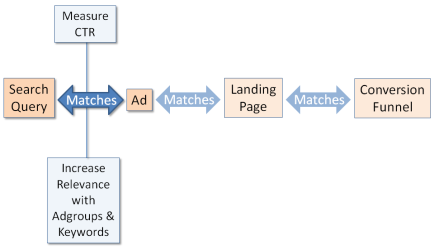 PPC marketing is like online dating: it’s all about making a match, baby! 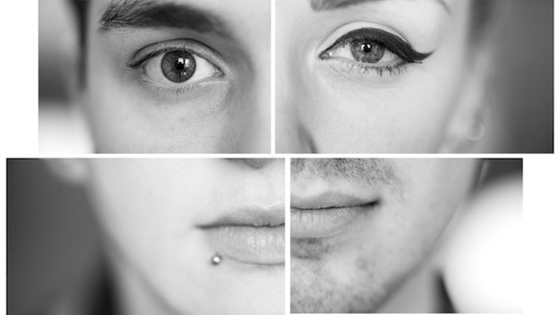 Online dating sites boast of their unique matching algorithms that pair lonely hearts with their perfect partner. Likewise, search engine algorithms assess how well your PPC marketing answers users’ needs. Your job as a savvy marketer is to maintain consistent relevancy at every step of the way to make the search engines happy, make your site’s visitors happy, and ultimately maximize your ROI. So Learn how to play matchmaker with Your PPC Ads and landing Pages. You’ll know whether your ads match your users’ search queries by looking at your ads’ click through rates (CTR). This metric simply tells you how many people clicked on your ad after seeing it. Obviously, the higher the CTR, the more relevant your ad is to people’s queries. Don’t worry about what’s a good or bad CTR; just aim to improve it. However, if you’re dying for some type of benchmark (you competitive old dog, you! ), go to the Opportunities tab in your AdWords account, click on “Analyze Competition”, and sort by CTR in the drop down. This took me to a landing page that sold clean, unused toilet paper (thankfully) and toilet paper stands. There’s no reason they should have shown an ad for used toilet paper. That’s just wrong on so many levels! Since CTR is the number of clicks divided by the number of ad impressions, you want to increase the numerator (number of clicks) and decrease the denominator (number of impressions). You can increase the numerator by separating your AdWords campaigns into logical ad groups around tightly-knit themes. 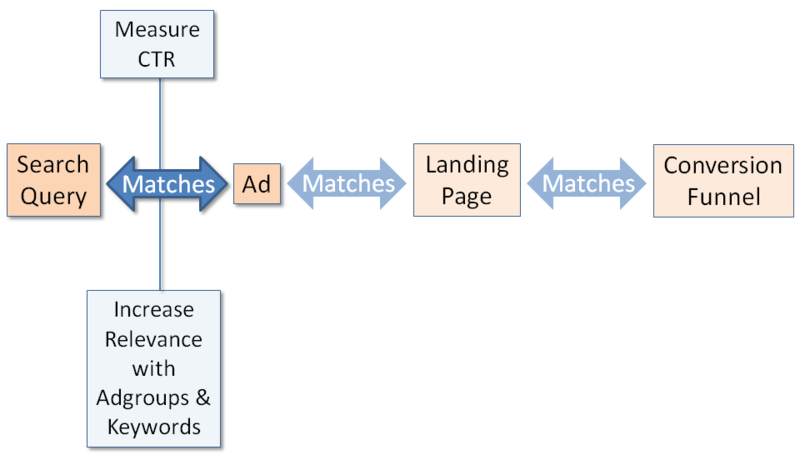 Use phrase match and exact match keywords to target people looking for what you’re offering. You can decrease the denominator by using negative keywords to ensure that your ad does NOT show for the people who you know will never buy from you. Note: CTR is NOT the most important metric for measuring overall PPC success; it’s simply the measurement of how relevant your ad is to people’s search queries. Ultimately, you need to measure profit by impression and profit by click. Read this excellent post by Brad Geddes for more on that. 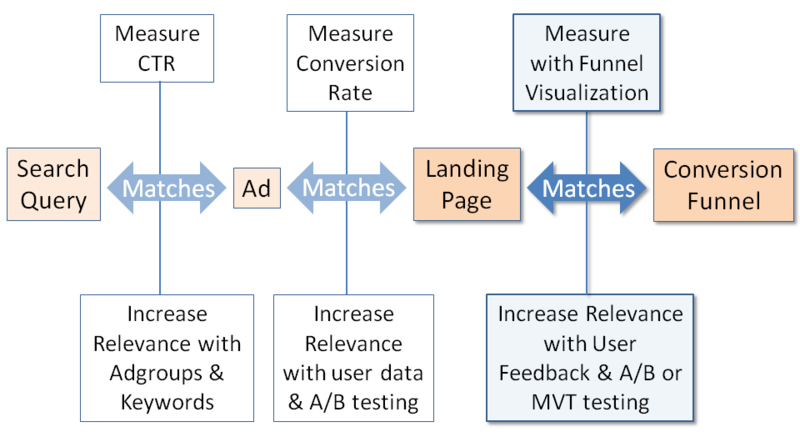 So you got the click and now you need to determine how well your landing page matches your ad. The metric to refer to here is your conversion rate. Admit it, some of you thought I was going to say bounce rate, right? Here’s the problem with bounce rate: depending on the type of landing page you have, visitors could come to your page, find all the information they need on that one page and leave, which would count as a bounce. In that case, a high bounce rate is not necessarily a bad thing. Instead, measure the percentage of visitors who complete whatever action you want them to take on your landing page. It could be to add a product to their shopping cart, fill out a form, click through to another page, call you, chat, spend a certain amount of time on the page, or a myriad of other actions. While Google AdWords reports on basic conversion data, Analytics gives you more insight because of the powerful segmentation capabilities. By default, Google Analytics does not report on your pages’ conversion rate, however; you have to let it know what your goals are first. Start with Crazy Egg or Lucky Orange to see how people interact with your page and to identify where problems exist. For example, notice how the heatmap of users’ mouse movements shows that people spent a lot of time hovering over the menu. But the heatmap of users’ clicks shows that after spending all that time hovering over the menu, they ended up clicking on the familiar links of “About us” and “Chat”. This shows that they couldn’t find what they were looking for, so the opportunity here is to reduce confusion in the menu. Crazy Egg and Lucky Orange will show you a lot of areas for improvement on your landing pages, but resist the temptation to simply change your pages based on your findings. Instead, run A/B tests in Unbounce to see whether the assumptions you made were right. Luckily, Crazy Egg integrates very nicely with Unbounce so you can collect user data on each variation. Sometimes you can get a macro conversion directly from your landing page, but often your site’s visitors will have to progress through multiple pages. For example, on ecommerce sites, the visitor might click the “add to cart” button on the landing page, but then have 3 more pages to visit in order to get through the shopping cart. When you have a multi-page conversion funnel, you have to measure how well your site’s visitors progress through each page in the funnel. The handy report for this is the Funnel Visualization in Google Analytics, which pinpoints which pages to focus your efforts on. 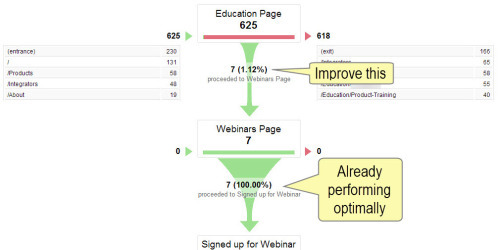 In the example below, we can see that everyone who makes it to the webinars page signs up. 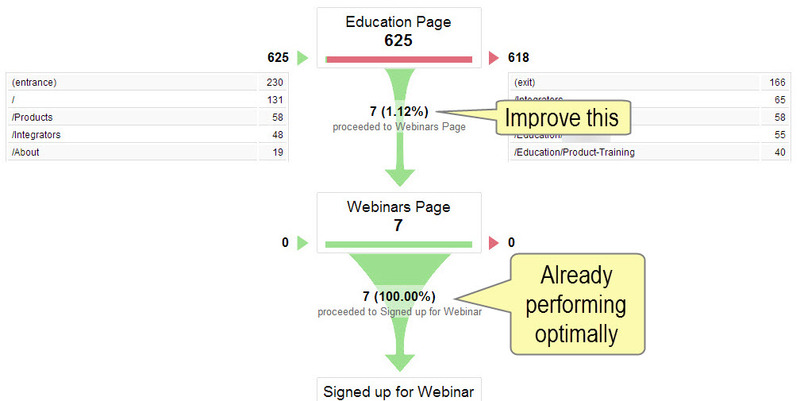 So our opportunity is to improve the education page and get more people to the webinars page. Google Analytics Funnel Visualization report gives you awesome insight into which pages cause people to abandon your funnel, but it doesn’t tell you WHY they abandoned. What do you remember the most about this page? What do you think you’re supposed to do on this page? User feedback will help you identify a slew of problems your site’s visitors have, which you never knew existed. Once again, resist the temptation to simply make changes to your site’s pages based on this data. Instead, use it to create your hypotheses of what you think will solve those problems, then run A/B or multivariate tests to see whether that’s right. Two fair-priced and user-friendly tools that are great for testing the funnel after your initial landing page are Optimizely and Visual Website Optimizer. 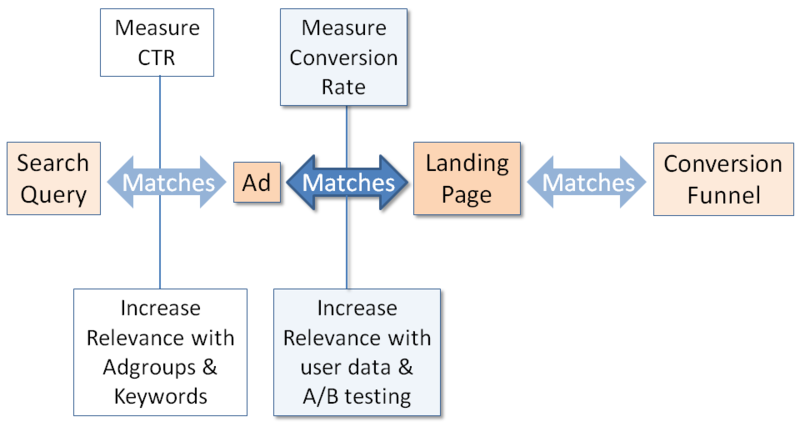 All three matches are equally important, so sharpen your matchmaking skills and allocate your resources to measure and optimize each one for PPC bliss. But just as any relationship takes work, optimization is not a one-time event. 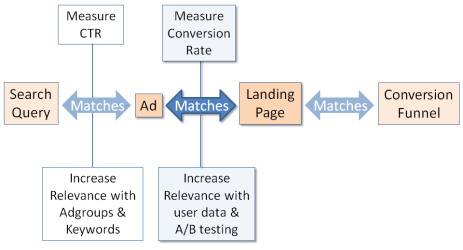 Make the commitment to do keyword refinement, collect user feedback, and run A/B tests on an ongoing basis to maximize your ROI on PPC till death do you part.